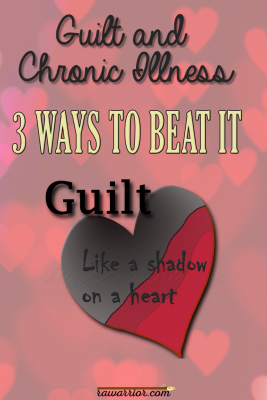 Did you ever stop and think guilt and chronic illness? Of course being sick is not your fault. There is nothing that can prevent being diagnosed with an illness. And you can’t make a cure instantly appear. We would, if we could. So, we’re innocent. Being sick with a chronic illness is not like having your tonsils out and getting extra ice cream. There are no benefits. Trust me: a handicapped parking pass is not fun when you really have difficulty walking. And if it the pain is not enough to steal the fun, there is always the way people look upon you for using the parking pass or the guilty way that makes you feel. When do I feel guilty about having a chronic illness? Why feel guilty when it’s not our fault? What can I do about this guilt? 1) When do I feel guilty about being sick? Here are some examples of times guilt and chronic illness get me down. When does guilt get to you? I feel guilty when my children miss anything that they would have had if I didn’t have RA. I hate the fact that I can’t make their lives as perfect as I want to. I feel guilty when I think of how much my healthcare has cost my family. I hate to realize the things we could have done for ourselves or others with that money. I feel guilty when I notice how little I am able to do now for my friends and neighbors or the church. I hate that RA has made it so difficult to live out the person that I still am on the inside. 2) Why feel guilty when illness is not our fault? I do not think we should feel guilty about things that aren’t our fault, but I can certainly see how it happens. Feelings are usually the result of thoughts. Whether what we think about is true or not, feelings are still produced. Personally, some of the unconscious thoughts I have about my RA are not very sensible, like the ones I listed above. Is it logical to blame myself for the cost of healthcare? Or not giving my kids a perfect life? But, keep reading – I don’t think we’re just stuck with guilt and chronic illness. 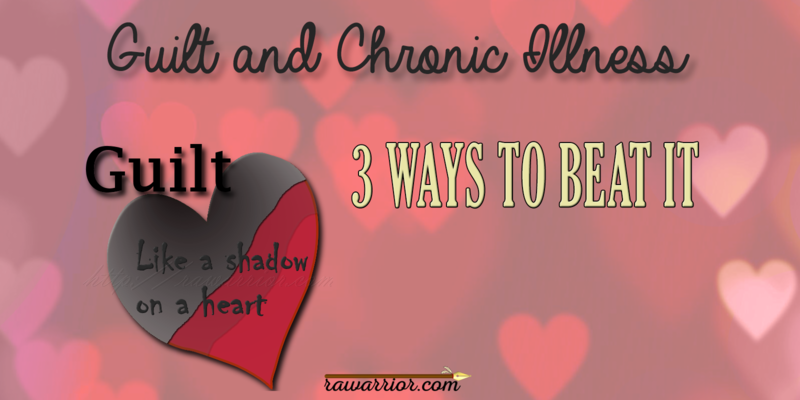 3) What can I do about feeling guilty about chronic illness? Maybe we’ll always have weak moments with guilt and chronic illness. However, we can fight back against adding guilt to our suffering. Here are three ways to fight guilt. The fact is, when it comes to my kids, it’s not my job to make their lives perfect. And my having RA might not necessarily make their lives worse. When it comes to the money, I am sure that if someone else in my family were sick, we would sacrifice whatever we had to for his/her healthcare. Friendship is good medicine. Friends accept who you are, including your limitations. Friends who also have chronic illness understand that support is needed. Whether they are sick or not, true friends encourage you to let go of misplaced guilt. You’re fighting the disease and fighting for every bit of life that you can. And when you fall short, which you will, forgive yourself with the same grace that you would forgive someone else. ← Rheumatology Blog Carnival #2: How Can Diagnosis Be Improved? Makes me feel better knowing that I’m not alone! Good point about the guilt list. Now: ironing. I was a good ironer, never one to avoid work… So that little iron will have no luck making me feel guilty. I lost ironing ability yrs ago when RA got to the wrists, elbows, shoulders. Now, my hands would protest if I even tried to pick it up. They’d say: “OH NO YOU DON’T – get away from me, Iron.” And I’d listen. Thank you so very much for sharing this with us, your readers. It puts words on these feelings I’ve been having for quite some time now, especially with regards to children! They are pretty quick to pick up my feelings and respond to the unsaid. Also, how hard it is not to be able to help out friends and extended family in need with homemade food, or help them do chores when sick… I feel often guilty about that. I already have to plan our own meals carefully, given that my RA is not under control, in spite of 25mg injectable mtx weekly and 2000mg sulfasalazine daily. I cannot have Humira as of yet because I responded positively to the tuberculine test. I meant to ask: how many of you take pain medicine daily? I’ve read comments about bouts of prednisone, but not a lot of RAers seem to medicate their pain. Am I mistaken? I medicate my pain. I wouldn’t be able to function without pain meds. I’m a diabetic so pred is out for me. I’m happy for people who are able to manage their RA without something for pain. I get irritated at those who think that we all should do the same. A good pain medication should manage your pain without making you feel “high.” I’m currently on Lortab 7.5 and it does a great job for the most part of keeping my pain in check. I know there is a trade off here. All the medications I take for RA are at some point going to have adverse effects on my liver. This trade is worth it to me because I’m looking for a better quality of life during the days I have. What do you mean by pain medicine? I don’t think that prednisone would be classed as a “pain” medicine. At least that’s not its primary mode of action from what I understand. I take a NSAID every day to help with pain and inflammation. For me it is a rare day when that is all I take. On better days I can get by with just Tylenol. On moderate and bad days I’ll take stronger pain relievers to help take the edge off and allow me to function as well as I can and not suffer so much. But I’ve had periods where I was taking stronger pain medicine every day for a while. Martine, I do need to create a post where people can put comments on pain meds. There are lots of discussions of them on the blog but they are here and there on various posts. I think that most patients do require pain meds at times. You might want to read this recent post about a huge study on RA pain in women & the comments’ page. There is also a Tag that you can click on about RA Pain and you might find some discussions there. It is true that most of us live with an unacceptable level of daily pain – and that study confirms that fact. I’ll tell you the same thing I tell MYSELF: don’t do that if you can help it. Talk with your doctor about the pain and ask for relief until something works. Sometimes the rheum doctor won’t treat the pain (according to many patients). If you need to, you can ask your primary physician. In some states, the primary has to refer you to a pain management dr for certain prescriptions. Florida (where I am) is getting stricter with new laws, but I can still get Lortab and my rheum doc is fine with prescribing it. It does not take away my pain, but it takes the sharp edge of usually. I hope this helps you. I hate that so many of us just suffer. I’m sorry that you carry this additional burden of guilt on top of illness. Perhaps it is my own personality, but I don’t fell particularly guilty about being sick or not being able to do all I want and/or the way it gets done. When I think about my limitations or times my illness let me or my family down, I feel more sadness. Don’t beat yourself up about it. The people that care about you understand. They know that if you could you would. Thank you. I wonder if it is more typical of women to feel guilty. But then I thought that if a man were young and couldn’t work, that would probably be a struggle for him too. Thanks for all the great work you’re doing, Kelly! Thanks for adding the guy’s view Michael. Always needed. I feel that being a woman who was raised in the post womens rights era we fit in a tight spot .. were told were to make money and strive to be teh best at everything work house and home kids ect..when we cant ballence it all out we tear ourselves up over it.. I BEING the first to admit it.. im my own worst enemy.. and also having a husband who isnt as warm and cozy about ra as some are i feel stress coming dwom from the family sides too.. its hard being us.. its hard being weak. and it tolls on the mind. I feel guilty quite often. I am in an almost constant state of fatigue. My husband, thankfully, seems to understand. He helps where he can. But my employer does not. It is pointed out to me quite often that I am not as effective or productive in my job as expected. I even find myself dozing off at my desk in the afternoon. It has been suggested that I should go on disability (to which my Dr says no). And recently it was pointed out to me that they cannot afford to keep someone on staff who is not productive. I understand this, but at the same time, I don’t know what to do about it. My employer does not have to pay into unemployment, and there is no long or short term disability, so I’m stuck. My guilt is quickly turning into resentment. Is anyone else in this same situation? YES! I was for some time. I ended up with a broken foot and was forced to not work. Some months and months later I finally was approved for disability… even though my doc was very much against the idea (even telling me she is a libertarian). If I were you, I would apply for it. If you can’t do the work you used to do, apply and appeal and appeal again if you have to…. what are you supposed to do? I think anyone who has RA and wants or needs to be on disability should get approved immediately. Don’t let them tell you that you’re fine… you’re sick and it’s OK to ask for help. Get a doc who will help you if need be…. Good luck, Janie. You have a french canadian name; are you a Canadian/Quebec? I live near Sherbrooke, Quebec myself, and would just looooooove to speak with an RAer here in french (much easier to express ideas & feelings!). This is an excellent post, Kelly! So I shall incorporate your 3 F’s into my memory to help me fight back. Facts. Friends. Forgiveness. That works for me. I’m overwhelmed by this. When do I not feel guilty? You have ‘hit the nail on the head’. I too feel guilty. Fortunately my husband is a great support (we commiserate with each other as he has COPD). Unfortunately, family is always struggling to understand that this arthritis is more than just achy joints. In this aspect, I feel guilty about why I cannot do what I once did. It is easy to wallow in self pity and guilt(and some days I do), but then I garner that strength to think “darn RA, I am NOT going to let it get me” and off to the gym to work it out. That is easier said than done as we all know. I am glad to read about others who suffer as I do and know that I am not alone. Do I feel guilty about having RA? No, not really. The further down this road I travel, the less guilt I feel. Being made to feel guilty by my family and friends is what I battle against everyday. Almost from the first I have had to defend myself with statements like “This is not my fault” or “I didn’t ask for this”. I feel frustration that I can not achieve the things I want to achieve and anger that all my plans for the future are not possible. My real friends understand, whether they have RA or not. Alot of the anger expressed by those who do not is frustration on their part, and something they will have to come to terms with, or walk away. I say to myself a hundred times a day….I’ll do what I can, and what doesn’t get done, oh well, maybe tomorrow will be better. First of all I want to thank and praise our Warrior Princess for coming out of her comfort zone to post this VERY IMPORTANT and personal info. Kelly, you are helping and touching lives you’ll never know about this side of heaven. I identify with EVERYTHING you wrote. I hate the guilt I feel beause I’m not the Wife, Mother, Grandmother, Sister, Aunt, Daughter-in-Law,Step-Mother, Nurse and Friend I long (and used) to be. I feel guilty that my grandchildren are growing up in another state, and I haven’t been able to travel to see them for a year and a 1/2. I hate and feel guilty about the isolation I’ve imposed on myself. I’m ashamed that I’m so vain, I don’t want people to see me this way. I feel guilty that my husband has to do everything, and when I see his anger and frustration growing each day. I feel guilty about the distance between us. I gave up making plans, and take it as it comes each day. I feel guilty that I can’t commit to anything. I feel guilty that I don’t have the energy or will to even try some days. I feel guilty that I’ve distanced myself from my 1st love, my Lord and Savior, Jesus Christ. I know this is where I need to start each day, with HIM, and let nothing interfere. I’m listening to praise and worship music right now——it really does help. You’ve said the rest, and I thank you with all my heart! Right on target, Kelly. Yesterday, I was going through some photos from before my diagnosis and I realized all over again how much has been lost, not only for me, but just from being able to blow and go and have so much fun with my family and friends. It brought back some really good memories, and also sadness and guilt that I am not the only one who has lost so much. Most of my grandchildren will not remember or even know the fun granny that they used to have. I know that it is not my fault, but at the same time, I feel that they have been cheated out of the great memories that they could have had. I have a lot of guilt too, and am so glad to see I’m not alone. I am still able to work and I give so much of myself to my job working with students with severe cognitive impairments that there isn’t a lot left over at the end of the day for my own children, thanks to the RA. I often lose my voice, and so my own children get the mom with no voice and little energy, and I feel guilty about that. My daughter has even occasionally said “I want my old mom back!” which, of course, made the guilt astronomical. But I am trying to achieve a little more balance. Not give everything to my students and leave nothing for my kids. Sometimes that means having my daughter hang out with me after school while I work. At least we have that time together. I certainly wish I had a magic wand I could wave, but this is my new reality and I’m trying to accept the good and the bad. It must be hard to hear your daughter say that she wants her “old” mom back. I’m not sure her age, but it might be worth a shot to tell her that you agree with her and would love the “old” you back too! Maybe you can use this as an opportunity to get her involved with awareness and fundraising for RA so that other people won’t have to lose their “old moms” too. I’m sure you don’t want to scare her, but kids appreciate honesty. I don’t know how you do it, but you always hit the nail on the head. When I feel guilty or get more depressed because I’m flaring up, or I just can’t do something or I do it and hurt worse for it, I find I hide in a game or book. Just disassociate myself with people. I attend the band concerts, even though sitting in the gym bleachers kills me, but it’s so important to my children. I try to remember to take a tramadol before, but I won’t ever _not_ go because I hurt. I do the same for sport events. I need to be there for them for these things, because it’s important to them, and they are important to me. They see it, though, the pain. But them being happy makes it dulled in a way. Again, thanks for letting me know I’m not alone. “but I won’t ever _not_ go because I hurt. I do the same for sport events. I need to be there for them for these things, because it’s important to them, and they are important to me. They see it, though, the pain. But them being happy makes it dulled in a way”. Oh Lord, the guilt. The ever-present monkey on my back. I’ve lost the man I thought I would grow old with, friends, my job…all due to RA. And I feel guilty every damned day! That I can’t work, contribute to society, have enough money to help out my college kid when she needs it, clean my stupid apartment, babysit for my niece, help cook holiday meals, plan baby showers…I feel useless and guilty because I am. Thank you Kelly, for bringing this out. It’s hard to think about, and I too, like a previous post, lose myself in games or books to block out the guilt and mental anguish over something I cannot control, or get rid of. Hi Raini, I wish I could give you a hug. I’m sure you are doing the best you can. I hope others in your life know it too. Your so right ! We should not feel guilty, but it’s easier to say than to do it. What I do not to feel this way, for example when I can’t do something, I explain why. So people know and understand what’s happening. Like: “I can’t come to your party because I’m too ill, but this doesn’t mean I don’t care, and I will come to see you as soon as I can”. Sound simple, but just to explain, can help. I like it Genevieve. We need to say it and let it go, don’t we? Hi Kelly, just letting you know as a 37 yr old man with RA. The guilt is there both about the pain to stop doing things and also about been the main bread winner. Fortunately for me and my family we were wise/lucky enough that we took out income protection years before, so money has not had to weigh so heavily on our minds. As my counsellor said no one in their right minds would put there hand up for this, therefore there should be no guilt towards having this disease!! Thanks for speaking up Rick. I’m so glad for your family that you had things so arranged! Good luck to you! I feel guilty for all the things that I cannot do, or when my kids say, “aww, mommy!” when I hurt. I don’t want them to think that! I really don’t want them to be concerned with my pain or inability to do things. I feel guilty that I am working and am on these boards (I feel I can hurt at home or hurt at work and at least be doing something). It makes me feel like an imposter. I feel guilty that I really just want to take a long vacation. But can’t. And that I can have biologics when others can’t. I feel guilty just taking time for myself, when that’s all I seem to do. I want to be rid of RA and just be what I was. But I tell myself that for every one of us, we are delt cards, and this is a card I was delt with, to deal with. All I can do is try, I guess. Yes I feel bad that things like clothes washing, dishes and cooking are not evenly shared anymore. I still work but feel guilty that I don’t get it all done. I feel guilty when I feel good if I do things for myself instead of for others. I understand that I shouldnt always feel this way. I forgive myself often, but it doesn’t help me sleep. Reading blogs such as yours and comments on them makes me feel less alone and a bit hopeful sometimes. Hang in there, we are all in this together. Before RA took a tight grip on my life, I was a GO GETTER! My friends called me the “Ever ready Bunny”. Now I take naps,cry from time to time from the losses, but NO GUILT! It isn’t my fault none of us asked for this gawd awful disease! No one can make us feel guilty but us. If other people try to lay guilt on us that is just “their stuff” I think they feel helpless that they cannot fix us maybe resentful that they have to pick up the slack, but it IS NOT OUR FAULT they know it too they are just human. I have to be offline for a few hours, but please leave your comments anyway & I’ll be back asap to reply. Thanks. I feel guilty when I have to cancel plans or bow out at the last minute. I’m very lucky to have a supportive husband and friends. When I was first diagnosed, 10 years ago, a good friend gave me a part time job so I could feel like I was accomplishing something. It made all the difference in the world. I own my own company so I don’t get looks from the boss, or have to explain why I’m limping today or why I’m not very productive today. And my husband is my business partner and my employee. And, I would never have started my own business if not for RA. I remind myself of that and all of my friends who help me when I call. Elizabeth, inspiring. Thanks for sharing & good luck. This is not offered as a solution for anyone else, just a commentary: I seem to have structured my older life to feel as little guilt as possible, by living alone, but in a bldg. with 35 people, and have gotten the message across that I’m not available for pop-in visits, and that I sleep late. Lest I sound anti-social, let me assure you I have more friends than anyone needs, and am social and active, but I can go around my apartment moaning when I need to, nap when I need to, eat what and when I need to, and give in to laziness if I want to. I feel far less guilt (still some if my bed isn’t made, LOL) than when I was a wife, mom, baby-sitting grandmother, and/or breadwinner and had to take time to rest. You said one thing that really hit a nerve with me. You are so right. Even if it were a friend I would be giving money to help them out. Why do I feel like people shouldn’t want to give the same for me? This helped. I’m sure I’ve heard it before, but probably from someone who is healthy, and well, that just doesn’t mean the same. Thanks Wendy. I’m reading a week behind since I was offline due to illness. I think we all help each other – the comments are fascinating & comforting to me to read today. 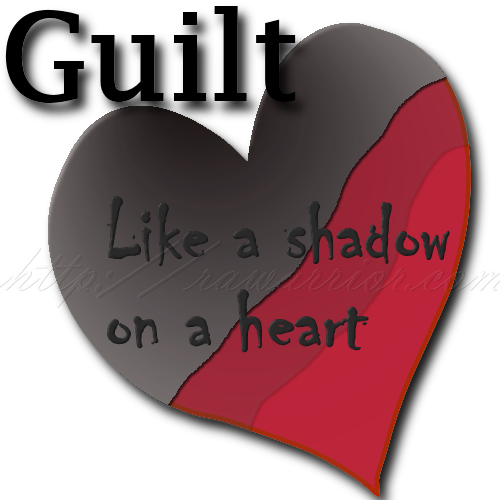 That’s really touch my heart, cause it reflect me like a mirror…. I was haunted by this “guilt” thing since the start of the year. And this led on to self-pity…no wonder I was really under the weather the past week. your hope was that this helped others with these feelings of guilt……….well, mission accomplished! Just my opinin..but I doesnt help when you hear..well if you do this..you wouldnt have that problem..drink this,drink that….we all hear it i’m sure..then when your told”things happen for a reason” it starts you thinking..then self doubt..which starts the quilty feelings…I’ll even add drs into this..because we also hear it from them..take pred.but at the same time loose weight…so we feel quilt from those things as well….. I sometimes wonder if you are in my head. Thank you. I really needed to read this. Even though my husband is very supportive and offers the same advise or thoughts as here, it helps to hear it elsewhere. I also take pain meds everyday to help manage my rd/ra and fibromyalgia . I.actually at times feel guilty for being on them and sometimes I feel ashamed. Its like.if anyone finds out you are automatically a drug addict. I hate reminding my Dr about needing refills he doesn’t make comments and he is in no way ugly about it its just the way I guess society has painted such a picture. Now his nurse on the other hand she is snotty about it and when she hands it to you she cuts her eyes and when u say thank you she goes mmmhmmm like u really.don’t need it. I have gotten to where I only answer her questions and I don’t say anything else to her when I go. I have mentioned it and.she is that way with everyone but is no excuse. Sorry for ranting this subject just makes me upset cause how we are perceived by society. Guilt is just a way of life now. Fear is what worries me, no husband , just adult kids currently underemployed enough to stay here and help me out. I have 5 kids, three have moved on. That is what you want for them, until this RAD came along after the very needed divorce. It’s the work that supports our life style, my work , me clearing a thousand dollars a week, my bills, my worries. The pain is getting ridiculous, a swollen hand a swollen foot, another infection, shingles, missing too much work. And now I got hurt at work, I am on their radar , I am someone who is frail, at 55 years old , 35 years almost, in a field I cannot retire from yet, not until another 13 years….haha. If I try to get another job, my dependability will be in question. I work in a large unit with a huge staff, eager for overtime, if I move to an easier but radically smaller staff, I will disappoint. So I am okay with the guilt, next year I am mailing the Christmas gifts from QVC Amazon and HSN right to their doors. That doesn’t sound too bad until you learn that all but one child lives in my zip code! Lazy, no, still thoughtful, just not wrapping. My secret is planning how to get away from the pain, if I lose my job, my benefits, my meds , my ability to care for others physically , how bad will the depression get ? SSD, is not enough to get by on , that is not the answer, sell the house now? Find a husband and blindside him? That is a joke, especially since I don’t go out or date. I live in fear, that someone will roll over my foot with a shopping cart, or hip check me as a joke, or the 25 year old drunk driver that slammed into my beautiful paid off car last year at a red light. Not fair, well everybody gets something, sorry to ramble, but fear makes me do weird things. Love you Kelly and appreciate all you do for us and especially what your family does to make it all happen. My Feelings In General: I feel guilty when the grocery store bagger asks if I need help to my car and I always say “no, I’ve got it, thanks.” WHY do I say no? Because I guess I feel then I have lost control of something i can no longer do. I need to let go of that and accept the help. I feel guilty that I had to add more meds to my work ’emergency medical form’ at work. Adding on Methotrexate and Tramadol. I already take five meds a day for PCOS -Metabolic Syndrome and have three doctors on my contact sheet now I am adding a Rheumatologist and more meds?? God forbid I was reluctant to turn that in. My co-worker who manages our personel files had a look of horror on her face when I gave her back the form because when I was first diagnosed it was for Palindromic Rheumatism and I became vegan thinking that was going to save me-maybe my cholesterol levels, yes. This co-worker is into herbs etc and always tries to give her impression that one should try to go natural first. Yes, well I’ve done that and I am done with it. Give me the Methotrexate and bring on the pain meds. I stay away from her now because I am tired of her asking how I am. I am tired of anyone asking how I am because I have to use energy to do it and no one understands or they want to hear you are suffering -isn’t that awful that some enjoy knowing that someone is having a hard time in life. So I have learned very quickly to keep my mouth shut at all costs. There are the folks and some are family who have told me to buck up and learn to live with it (usually older folks-who have Osteo) or those who want a day by day play of how I am doing and can they help me do anything. Those who mean well can exhaust me too. One lady at work had the nerve to ask me how the chemo (MTX) went after the first night I took it. She the stared at me like a hungry dog waiting for a bone as if she wanted me to tell her I barfed all night and chunks of my hair fell out. I told her I popped the pill in my mouth swallowed it and went to bed. I then gave her a Cheshire Cat grin and walked away. The nerve of her. I am learning that each day is different from the next and pain can be worse or less as well as energy levels. I am just getting my pain managed as within two months of my first Rheumy appt if has progressed so quickly. My MD started me on MTX last Wed as he told me it is progressing and he is not waiting around to see what happens. I realize that I am very fortunate that he is taking aggressive action. I am sero-negative at this time which he told me can also change. My husband and I have grown closer and we try to walk together at least 3 times a week. Sometimes I can do 5 miles sometimes 2. The pain is mostly in my wrists and hands. L hip/lower back and knees. Less so in the knees and ankles. I don’t know anyone personally with this disease. So this blog is a great place reach out to others. Thanks Kelly. Kelly, once again you have confronted a problem that seems to be shared by most people with RAD. I was diagnosed with RAD in 2007, & guilt has been a problem for me from the very beginning. I was the mother of a special needs child for 32 years. He was autistic, my only child, & the happiest & most loving person I ever knew. He had started living in a group home in 2004. I got him at least once a month for a weekend visit from the time he moved in until about a year ago when due to the progression of my disease it had become increasingly hard for me to keep him for 2-3 days, he was extremely active & required constant supervision 24/7, even during the night as he would wake up at all hours. So for the last year the visits were less often & sometimes for a shorter period of time. Six months ago, my son died in his sleep. He was not sick, the coroner did an autopsy & could find no reason for his death. Thankfully the weekend before, he was home for a visit, it was his 32nd birthday & we had a party with the works! He was happy & so sweet, it was the best weekend visit we’d had in a long time! He was not very verbal, but that weekend he had said “I love you Mom”! I can’t tell you how my heart felt when those words came out of his mouth! On Sunday we took him back to his group home which was awesome & he loved it! The following Friday night he passed away. Now I am left with the guilt of not spending as much time with him that last year of his life because I was too sick. If I had known, maybe I would have tried harder. Well said, guess my putting on a smile each day and trying to cope with the limitations has been giving me nightmares riddled with silly stuff about letting my family down,being an outsider looking ,all kinds of crazy stuff my therapist helps me sort through. The desire to go back to my healthy state of being has been on my mind alot and with her help I can understand that chronic illness is a bugger and this too is part of my letting go of things I feel guilty about. Thank you for being here. Hi, this is my first time here. Your article was right on point!I feel guilty daily about the overwhelming fatigue and pain/ stiffness that keeps me from doing so many things I feel responsible for doing. That said folks here have a wonderful gift that I do not have: this blog. You have each other to lend support and understanding.you see, I do not have RA, I have severe psoriatic arthritis. To my knowledge there are no communities for me.Many folks have never even heard of it. I have long wished for a community like this to be a part of.I am here through your article on PA.Best of luck to everyone and God Bless. this is the first time I write a comment. I started reading your blog recently, as I just was diagnosed. I find it quite useful, I mean… I feel like I’m totally lost, I don’t know what to expect, even if I’m surrounded by rheumatologists (my father in law is one of the best rheumatologists in my country, what are the odds? even if I don’t like mixing things, I just had to make him part of my treatment, at least at the beggining)… the fact that nobody can tell what will happen is very strange. Well, I’m commenting here because it’s not the first time with illness (chronic or not) and I totally relate with what you’re telling. I suffer from depression since I was 17 (I’m almost 28 now) and it doesn’t seem it will go away, at least not soon. When I was 20 I started having an eating disorder (anorexia). I’m a lot better now, but I know I’ll never recover. I mean, nobody does it fully. Even if you seem to behave normally, chances are your head is still obsessed with food, at different levels. eating will never feel “natural” for you. And you know that any stressful event in your life may lead you to relapse. Now it’s RA’s turn. As I told you I was recently diagnosed (luckily, it was early in the disease, because I just kept googleing my simptoms and already went to the rheumatologist KNOWING there was something wrong… even my father in law thought it was nothing… but it turned out they already spotted erosions in my MRI). I have a lot of strange feelings going through my head. I find it easier to cope with guilt, as I had to manage it when I got sick before. I mean, I just felt I was ruining everybody’s life. When I was in my worst times with anorexia, I was even aggresive. For my family and ex boyfriend, it was not only the sadness of watching a loved one trying to dissapear, but they had to deal with my anger because of them wanting to help me. I just wanted everybody to go away and isolate my suffering. I felt it was my fault, and I just deserved to suffer on my own. the fact is you’ll never stop feeling guilty. as you say, feelings are not “controllable”. that’s one of the first things I learnt in therapy, because it helped me manage my anorexia (I felt that I was pure crap, that I deserved to die, but I had to think rationally about all the things I was capable to do, all the people that loved me, and just believe that I was worth living, until I eventually started FEELING it). The guilt never went away, I’m still sad because I knew I hurt a lot of people and some things I will never recover. They’ll never be the same, and I won’t either. I’m not worried about myself, I learnt a lot, even if it was the worst time of my life. I grew more than I would have grown ever. But I just feel guilty about what I put my family through; even if they also learnt and grew, I think they didn’t need to suffer so much. Well… that’s a little how I feel about RA, and it’s just starting. I live with my boyfriend now, and he’s always there for me. ALWAYS. he just cares so much, I think my diagnosis affected him more than me. and I know I’ll feel guilty (I already do), but I just think: I’d do exactly the same for him. I want to tell you that I also started a blog when I got diagnosed. It’s in spanish, so you can google translate it if you want to read. well that’s it.. I wrote a lot.. I’ll try to comment on more posts, even if they’re old, I’m chaotically jumping from post to post since I was diagnosed, so… you’ll hear more of me. I do not have RA. My daughter does. Another perspective of guilt and RA. – The cause is unknown, but likely from part genetics and part environment. We gave her both her genes and her environment. I feel guilty. – The extra burden and pain she will likely have for the rest of her life. Things she has had to give up already (HS Swimming). Medical costs for her. Weekly shots. I feel guilty. She handles it better than I do, I need to handle it better for her sake and mine. I’ve been coming here for a while now, but never commented before. This topic gets me. Do I feel guilt? Every. Single. day. I have an 11 yo beautiful , smart, funny daughter who is stuck with a mom who is sick all the time. I doubt she remembers the mom who used to do all kinds of things with her. I have a wonderful hard working husband who works his tail off to provide for us. He totally doesn’t get it when it comes to my RA, but he tries. I’m s SAHM now, have been since daughter was 3, hubby is self employed, so we carry our own health insurance, which is crazy expensive, & we STILL have a $6000 deductible. I feel so guilty about how much we spend on my health care needs. I’d love to go back to work (I’m a nurse) just to have less expensive health insurance, and to pay off some debt, but there’s no way I could do it with my health issues, and I doubt I’d be eligible for disability since I haven’t worked in so long. I feel guilty for asking for pain meds, have had Drs treat me like I’m some kind of junkie. My rheumy won’t prescribe pain meds at all, which I find odd, since she’s treating people with legitimate chronic pain. My PCP prescribes tramadol, which often doesn’t help at all, and nucynta (which is a newer narcotic pain med) in very limited amounts, and it’s just not enough. I still have many, many days where I’m just plain miserable and can’t function. I don’t expect to be pain free, but I don’t think it’s too much to ask to have my pain taken seriously and treated properly so that its at least bearable. I have an appt Monday, and am gonna have to try to broach the topic with my doc, and I dread it. I have a feeling shes gonna be resistant to the idea of increasing them. She really didn’t wanna prescribe the nucynta in the first place. But she doesn’t want me taking prednisone to help control the constant flares, either, so I fell like she’s left me no other choice. How in the world do people ever get doctors to prescribe pain meds for ANYTHING?? I’ve never misused pain meds, so I don’t know what the issue is. And my mom and brother (who are otherwise wonderful) think that anybody who takes pain meds on a regular basis is an addict. What nobody gets is I would rather not take them, but I have to in order to survive and function. I’d rather have the biologics and DMARDs and anti inflammatories work to control the disease so I DON’T need the meds. Wish me luck and say a little prayer for me for my appt Mon that my doc is receptive and understanding of my concerns. Maybe a pain management referral is in order. I’d rather not have one more Doctor I have to go see…it’s exhausting. But if it means getting some relief, I’ll do it!! As someone with major depression for my entire adult life (I’m almost 72), my RA causes so many “can’ts” in my life that I’m very angry. My “real” depression is under control, but I get so angry and hopeless; my biggest issue is that I have to be taken care of much of the time and I know it will get worse. I can’t tell anyone how badly I just want all this to be over so my dear husband can get on with a normal life. He insists it’s not an issue, that he loves me deeply (which I know to be true), but I love him and this isn’t fair. I sometimes think about suicide so he doesn’t have to put up with this, but I know it would devastate him and my sisters (I have no children). Does anyone else with RA think this way? This is my RA talking, not the major depression. I know the difference! I’m so angry that I “can’t” do stuff anymore and he has to do everything. Not fair to him…it’s not so much pain as overwhelming fatigue and soreness. I have a great rheumatologist and therapist but I’m still so churned up.